MaiMai is a rhythm action game for arcade from Sega Japan in which players are faced with a round screen with buttons along the outside. While rhythm is required, dancing and fancy foot skills are not! Players select a song they wish to play along to, and when the little rings start popping up in the center of the screen and float outwards players must hit the corresponding button. Also, there will pop up on the screen a Star Mark, which players most softly trace across the touch screen to get bonus points. While MaiMai uses both button and touch screen inputs, when it comes to the rings, it is recommended players use the buttons as they will give a more accurate response. It is also recommended that players wear a glove on the hand they will use to trace the Star Mark, a touch screen compatible glove preferably, for a softer touch and a better response from the game. The game comes as a twin unit and ca link up to two units for four player compatibly as well as single player modes. Other features include the games connection to the SEGA.NET network for online functionality. Players select a song they wish to play along to, and when the little rings start popping up in the center of the screen and float outwards players must hit the corresponding button. Also, there will pop up on the screen a Star Mark, which players most softly trace across the touch screen to get bonus points. While MaiMai uses both button and touch screen inputs, when it comes to the rings, it is recommended players use the buttons as they will give a more accurate response. It is also recommended that players wear a glove on the hand they will use to trace the Star Mark, a touch screen compatible glove preferably, for a softer touch and a better response from the game. The game comes as a twin unit and ca link up to two units for four player compatibly as well as single player modes. Other features include the games connection to the SEGA.NET network for online functionality. This is a Highway Entertainment video. 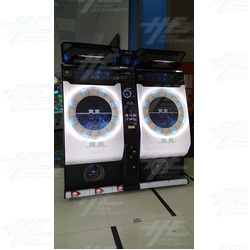 Footage of the MaiMai music and rhythm arcade machien from Sega at the GTI Asia Taipei Expo 2013.